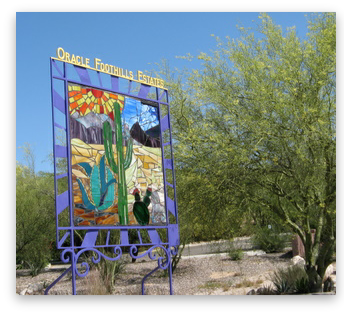 The Neighborhood Association is involved in many activities around Oracle Foothills to further our goals of preservation, beautification, improvement, socialization and enhancement of the quality of life. We encourage all neighbors to get involved and become a part of our community. 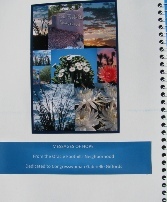 On this page you can read more about . . . 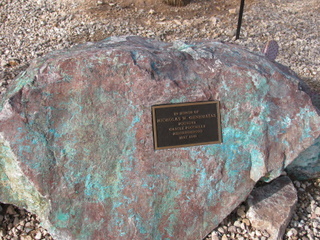 In appreciation for the foresight of our neighborhood's founder, Nicholas W. Genematas, in creating this unique subdivision of natural landscapes, large properties, diverse homes and winding roads, a plaque was placed in the Triangle Park on one of the Arizona native copper mineral rocks. Thanks to George Grimm for taking the lead in this project, and for the work of Angelo Dellacona and Jay DeAngeli in placing the plaque at the Triangle. 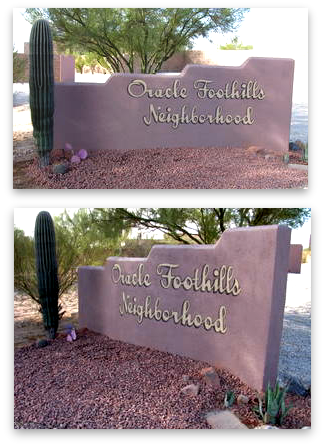 From blank wall to attractive entrance monument, this transformation took place in 2009 as neighborhood artist Ed Muren, with a contract from OFNA, added a touch of class to one of our main neighborhood entrances. 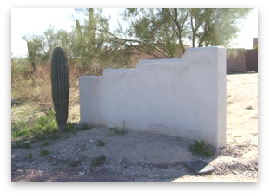 This blank wall had stood at the corner of Agave Drive and 1st Avenue for quite some time. 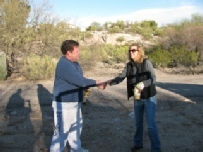 George Grimm and his committee conducted a search for an artist and awarded the contract to Ed. 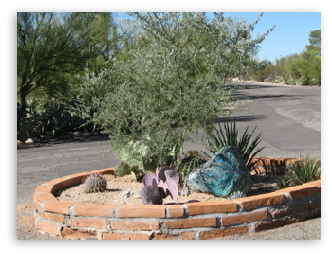 Thanks also go to the committee - George Grimm, Angelo Dellacona and Camille Zachmeier; and to those who contributed to the landscaping - George, Angelo and Jay DeAngeli. Under a cloudless October sky on a day so perfect that everyone declared, "this is why we live here", neighbors gathered to enjoy one another's company, to share a bounty of good food, to celebrate fall and Halloween, to laugh and share stories, to cheer on the children's attack on the piñata, and later to revel in the rising full moon as we sat around the campfire. 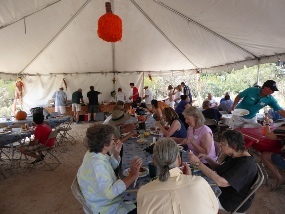 Each year in October, OFNA sponsors a picnic for the entire neighborhood. Neighbors bring potluck dishes to share, while the chefs grill chicken, baby-back ribs and brats. 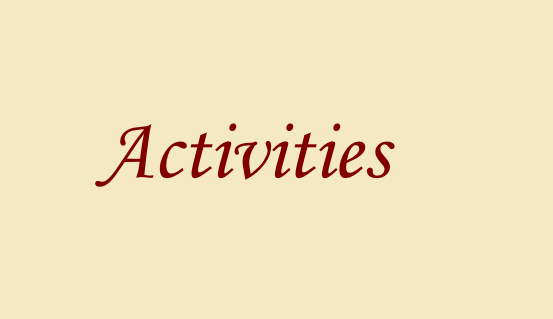 Kids are entertained with a jumping castle and fun activities. Adults, too, are sometimes entertained with neighborhood talent. They’ve all been fabulous and we look forward to seeing you at the next event! 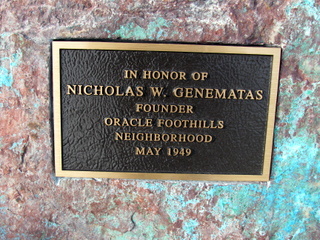 The historic Oracle Foothills monument at the corner of Genematas Drive and Oracle Road was originally installed by Nicholas Genematas, the founder of the neighborhood. By the late 1990’s, the monument was suffering from neglect and had fallen into disrepair. The wrought iron frame, which had apparently once held a map of the subdivision, was empty, and weeds and trash collected at the base. Neighborhood resident and artist, Kitty Schwartz, created and installed a wonderful stained-glass scene to fill the framework. 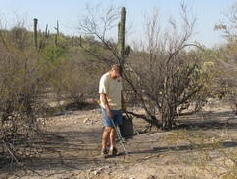 The site was weeded and cleaned and some new vegetation planted. More work was done to beautify the monument in 2009. Neighbor Jay DeAngeli painted the framework and the back of the stained-glass panel. Overgrown vegetation was removed, new landscape gravel added, along with more weeding and trimming. It was once a sadly neglected street island at the intersection of Genematas Drive and Canyon View Drive, a place where cars parked for nearby garage sales, where the school bus parked, where invasive cactus and weeds had overtaken native vegetation, where original adobe walls were crumbling and trash frequently collected. Certainly not something of which the neighborhood could be proud. 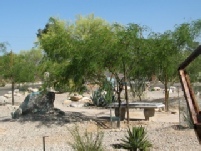 All of that changed in 2006 when the area was transformed into a tranquil mini-park with the help of many neighbors and a grant from PRO-Neighborhoods. 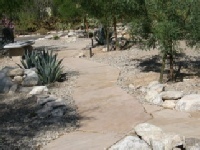 The original adobe walls were rebuilt; trees were trimmed; invasive, non-native cactus was removed; fill dirt was brought in to sculpt mounds and planting areas; boulders were placed; native and desert-adapted shrubs, trees, cactus and flowers were planted; artwork and a tiled bench were added; a flagstone walkway was laid and wildflower seeds were planted. Thanks to all those who have worked so hard to make this mini-park a place enjoyed by the entire neighborhood. Inspired by the Triangle Park transformation, neighbors on Yvon Drive took the initiative to renovate the traffic circle at the corner of Yvon Drive and Nina Drive. 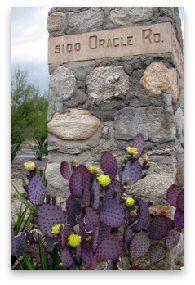 It had filled over the years with bunny's ears cactus and the adobe walls were crumbling. 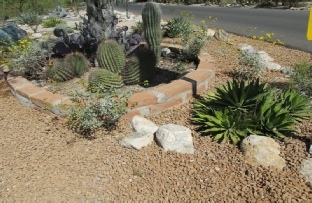 After the invasive, non-native cactus was painstakingly removed, the walls were rebuilt and new native plants were installed. 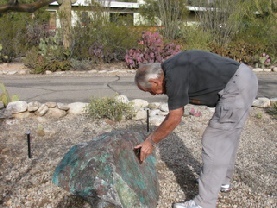 Lastly, a large copper ore boulder was placed in the circle. 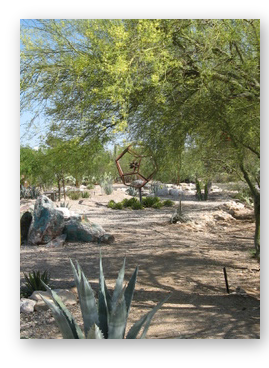 Now, as the surrounding neighbors continue to maintain the circle, the ironwood tree blooms in spring, native wildflowers provide color, agaves and native prickly pear add to the beauty. 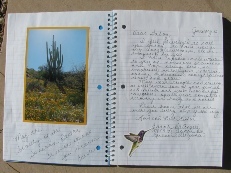 Oracle Foothills residents created a book of messages for Representative Gabrielle Giffords following the tragic shooting on January 8, 2011. 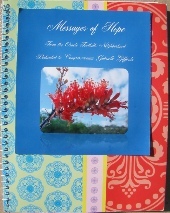 The book was signed by over 100 neighborhood residents offering inspirational thoughts and well-wishes, and then it was delivered to Gabby’s rehab room in Houston. Thanks for the book go to Diane and Tim Bowden, Jay DeAngeli, Angelo Dellacona and Suzan Jervis. 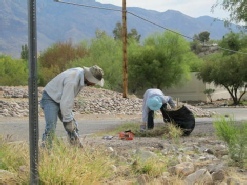 A small group gathered on two Saturdays, April 23rd and May 7th, to dig buffelgrass along Rudasill Road. 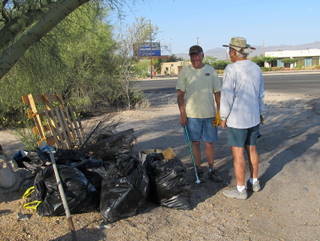 Though we made a big dent in the infestation, there is more work to be done before the area is cleared. The work on this section will be ongoing. 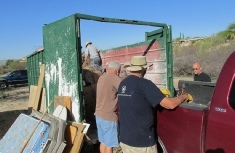 Thanks to those hardworking volunteers who showed up to assist in this important project. 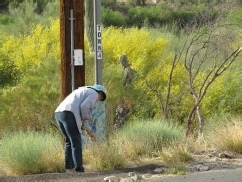 For more information about buffelgrass and the threat it poses to the Sonoran Desert, go to the Buffelgrass article on the Issues page. Thinking that all the homeless residents had been moved out, a group of Oracle Foothills neighbors set out on Saturday, June 18th, in the cool of the early morning to clean the large vacant property at the entrance to our neighborhood, to clean up the camps and all the trash that gathers from passing traffic on Oracle. 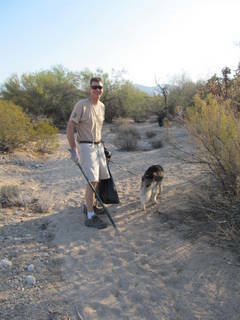 Nothing’s easy about picking up litter in the desert, where mesquites and chollas hang for dear life onto the detritus of human society, keeping the humans at bay with their spines and brambles. 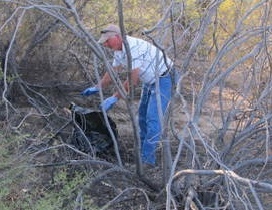 Before long, we discovered two more homeless men living not far from the previous camp. 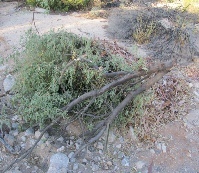 Firewood had been gathered and stacked in large piles, certainly not to keep the campers warm, maybe to cook the m eals. Just what we need in this tinder-dry year. Bag after bag was filled with cans, bottles, soda cups, wrappers, styrofoam, plastic bags, food containers and all the other odds and ends that accumulate among the vegetation. Thanks to Mark Andersen, Phil Williams, Carolyn Redmore, Sandy Elder, Steve Kuhn, Maria Brandauer, Joan Scott, Jay DeAngeli and Carole DeAngeli. 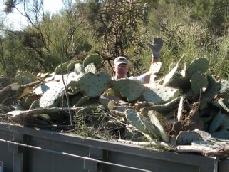 Also, thanks to Don Bourn’s maintenance guy, Don, for hauling it all away. It was wonderful that so many of you came out on a spectacular Fall day to share some good food and conversation with your neighbors. Thank You to all our excellent, hard-working volunteers who made everything go so smoothly. 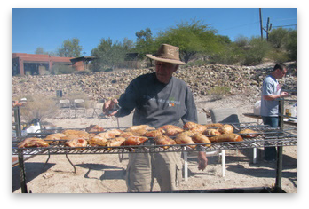 Thanks for all the delicious dishes, and of course thanks also to our chefs for the amazing ribs, chicken and brats. It was fun to see so many kids! 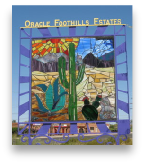 Is an ongoing issue in Oracle Foothills. 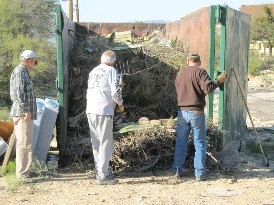 Recently, a wash frequently used by lazy and unscrupulous landscapers to dump yard refuse was cleaned up by Pima County Flood Control and DOT. 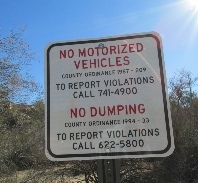 A sign was placed warning against dumping. Thank you to Fred Neasham for his assistance on this project. 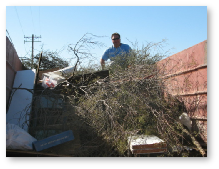 If you witness someone dumping in the wash, get a license number and call 911. 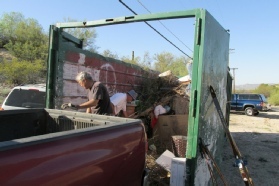 Thanks to all who participated in Dumpster Day. And special thanks to our volunteers - Jay DeAngeli, Phil Williams, Robert Bolton, Richard Remington, Barbara Bolton, Ron Kuykendall and Dean Siler. Pam Remington made delicious breakfast burritos for the workers. After years of complaining, letter-writing, phone calls, meetings, petitions, media attention and arm twisting, OFNA was finally successful in getting our deplorable neighborhood streets repaved. The difference is truly amazing. 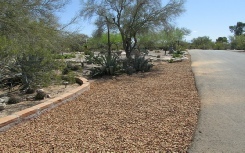 Ours was the only neighborhood in Pima County to get this level of paving activity. Our sincere thanks go to the office of then-Supervisor Ann Day, whose staff listened to our pleas, to Jay DeAngeli, who kept up the pressure from OFNA, and to supervisor-candidate Mike Hellon who made the streets a campaign priority. 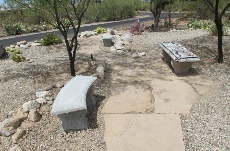 The Triangle Park at the corner of Genematas and Canyon View recently got a facelift with the addition of decorative rock around the outside perimeter and two new benches. 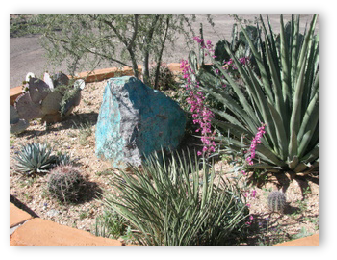 Plants were trimmed and excess agave pups removed. Thanks to Angelo Dellacona for taking the lead on this project, and to his able assistants, Jay DeAngeli and Robert Bolton. 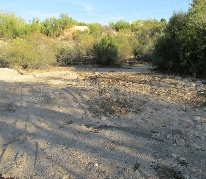 On November 18, 2014, the Pima County Board of Supervisors approved the abandonment of the county right-of-way on the westerly portion of West Yvon Drive, running between Genematas Drive and Oracle Road. The property was deeded to the adjacent property owners. That portion of the road is now private property. 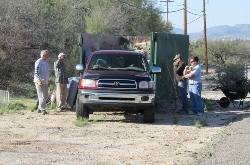 The property owners have chosen to close the road between the Lodge property and Oracle Foothills. Therefore, there is no longer any through traffic allowed. Please respect the private property of these neighbors. 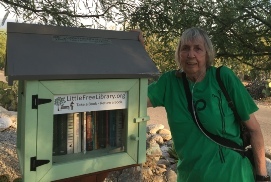 In July, 2016, a Little Free Library was donated by Marti Kuykendall and her daughter, Kathleen Garrison. The library was mounted and installed by Jay DeAngeli and Angelo Dellacona in the Triangle Park. 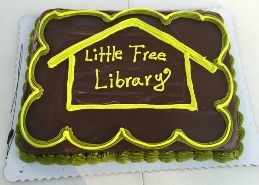 On July 30th, a gathering was held to dedicate the library and to thank those who made it possible. 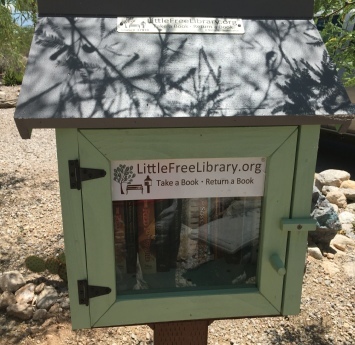 The LFL is a free book exchange for all members of the neighborhood. Take a book, Leave a book. 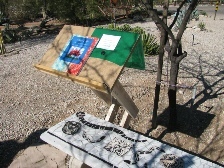 Little Free Library is an international organization which promotes literacy and connects neighbors. Our LFL is registered with the organization and can be located on the map. Our registration number is 37916. 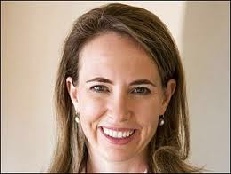 Our steward is Marti Kuykendall, and you can contact her with any questions or concerns. 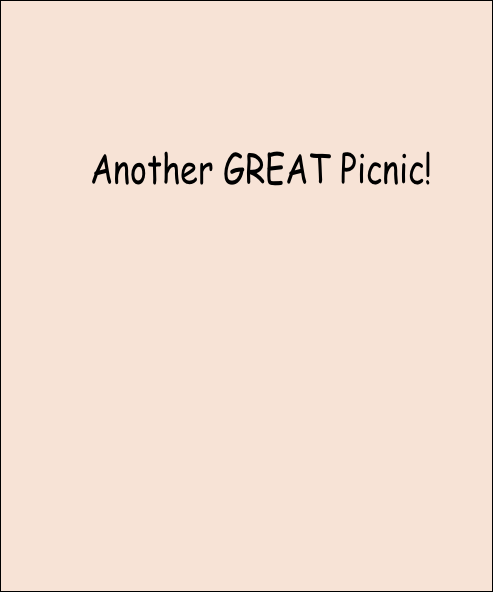 What a beautiful day for our Annual Neighborhood Picnic! A Big THANK YOU to everyone who made it possible. Particular thanks to Bente and Johnny Jensen, who graciously offered the use of their property, and spent many hours making preparations. Thank you also to the Martins and Juliens for allowing us the use of their driveway and parking areas. Many people helped with setup, cleanup, cooking, loading, delivering, decorating, food preparation, purchasing, children’s activities, and so much more. To each of them, Thank You! 2016 was our 17th year, and perhaps the best ever! 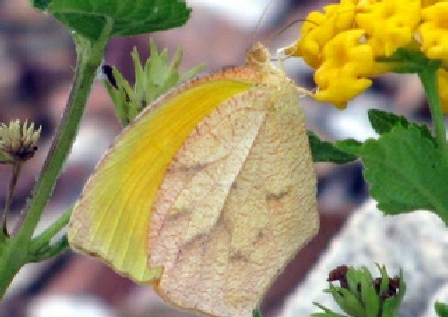 For all the photos, click here.